Sandisk, the popular maker of Memory cards and other storage devices has announced the making of a very spacious SDXC memory card with 1 Terabytes (1Tb) space. At the Photokina 2016 photography show on Monday, the leading flash memory products manufacturer revealed a prototype of a mind-blowingly spacious one-terabyte (ir 1,000 GB) SDXC memory card. The announcement of the card comes 16 years after SanDisk's parent company, Western Digital, introduced the first SanDisk 64MB SD™ card, and though this new card has a much greater storage capacity, it still somehow manages to remain the same convenient size as a regular memory card. In a press release about the memory card, Dinesh Bahal, the vice president of product management and content solutions at the business unit for Western Digital said, "Showcasing the most advanced imaging technologies is truly exciting for us." The release states that the SanDisk 1TB SD card prototype "represents another significant achievement as the growth of high-resolution content and capacity-intensive applications such as virtual reality, video surveillance and 360 video are progressing at astounding rates." Sam Nicholson, the CEO of Stargate Studios and member of the American Society of Cinematographers, explained in the press release that with high-capacity cards like the 1TB, not only can camera users store more images, but they can also capture them continuously without the hassle and interruption of switching cards. 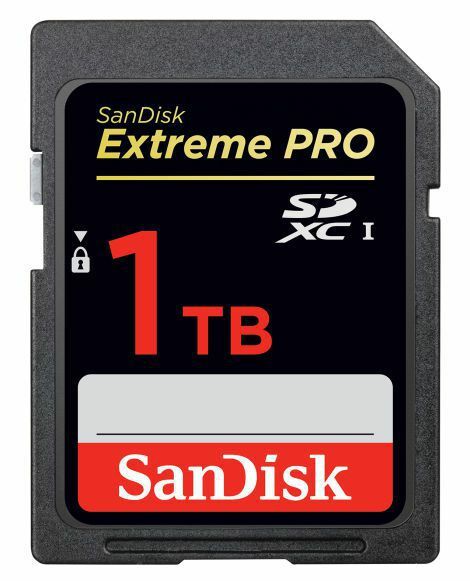 The 1TB card has nearly doubled the storage capacity of the company's impressively large 512 GB SDXC card, which was also released at the Photokina photography show back in 2014. “Just a few short years ago the idea of a 1TB capacity point in an SD card seemed so futuristic — it’s amazing that we’re now at the point where it’s becoming a reality," SanDisk wrote. Since the card is still in its prototype stage, there is no idea of how much it will cost. However, the 512 GB SDXC card sells for a whopping $800, so we're guessing the extra space will be quite expensive.